Nyang Tingdzin Zangpo (Tib. མྱང་ཏིང་འཛིན་བཟང་པོ་, Wyl. myang ting 'dzin bzang po) (eighth-ninth centuries) — a key figure in the establishment of Buddhism in Tibet and more particularly in the early transmission of the Vima Nyingtik. He was one of the few masters in history said to have attained the rainbow body of great transference. In Words of My Perfect Teacher he is credited with suggesting to King Trisong Detsen that he should invite Shantarakshita to Tibet, and in the early accounts of the Vima Nyingtik lineage, he is also credited for having suggested to invite Vimalamitra to teach in Tibet. After being a court priest during the reign of King Trisong Detsen, he also continued to be a royal minister during the reigns of Tridé Songtsen and Tri Ralpachen, further supporting the establishment and flourishing of Buddhism in Tibet. 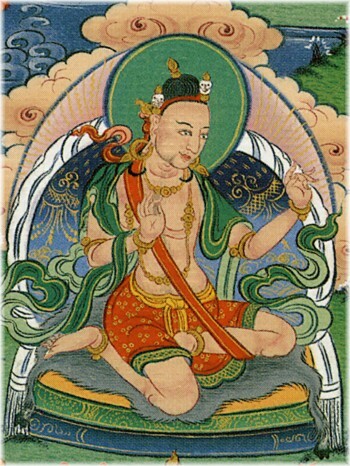 Nyang Tingdzin Zangpo was one of the five Tibetan disciples who received the cycle of the Innermost Secret Nyingtik of Dzogpachenpo from Vimalamitra, in strictest secrecy in the room known as Ütsé Barkhang in Samyé. The tradition of Nyingtik which came down from this transmission became known as the Vima Nyingtik. Nyang Tingdzin Zangpo practised these teachings for fifty-five years, totally purifying his mind and attaining ultimate realization. After having built the temple of Shya Lhakhang (Wyl. zhwa lha khang), he hid the texts (the explanatory tantras, Wyl. bshad rgyud) of the Vima Nyingtik in various places of the temple, so that the teachings would remain intact for future generations. He also transmitted the aural lineage (Wyl. snyan rgyud) to Bé Lodrö Wangchuk. Thus, the lineage of the Vima Nyingtik became partly 'hidden' (terma), and partly 'oral' (kama). ↑ See Wellsprings of the Great Perfection, compiled and edited by Erik Pema Kunsang (Boudhanath, Hong King & Esby: Rangjung Yeshe Publications, 2006), page 150. ↑ According to Dudjom Rinpoche's History, he transmitted the oral lineage to Drom Rinchen Bar. Dudjom Rinpoche, The Nyingma School of Tibetan Buddhism, Its Fundamentals and History, trans. and ed. Gyurme Dorje (Boston: Wisdom, 1991), pages 555-556. Nyoshul Khenpo, A Marvelous Garland of Rare Gems: Biographies of Masters of Awareness in the Dzogchen Lineage (Junction City: Padma Publications, 2005), pages 82-83. This page was last edited on 9 April 2018, at 04:42.